Euprhasia Officinalis. So called from the very bright eye of its flower, and from its efficacy in clearing the eye-sight. 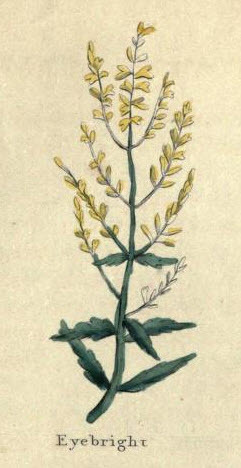 Common Eye-bright is a small low herb, rising up usually with one blackish green stalk, six or eight inches high, spread from the bottom into several branches, whereon are small, almost round, pointed, dark green leaves, finely snipped about the edges, two always set together, and very thick. At the joints with the leaves, are small white flowers streaked with purple and yellow spots or stripes. the root is long, small, and thready at the end. It grows in meadows, and grassy places. If the herb was but as much used as it is neglected, it would half spoil the spectacle-maker's trade. The juice of Eyebright dropped into the eyes, for several days together, relieves infirmities of the eyes that cause dimness of sight. Some make conserve of the flowers to the same effect. Being used any of the ways, it strengthens a weak brain or memory. Tunned with strong beer, and fermented together; or the powder of the dried herb mixed with sugar, a little Mace, and Fennel-seed; or the powder made into an electuary with sugar, has the same powerful effect to restore sight decayed through age; and Arnoldus de Villa Nova says, it has restored sight to them who have been blind a long time.